The Untitled Space gallery is pleased to present, “Thoughts and Prayers,” a solo exhibition of works by artist Sarah Maple, curated by gallery director Indira Cesarine, opening January 22, 2019, and on view through February 3, 2019. Sarah Maple is an award-winning visual artist known for her bold, brave, mischievous and occasionally controversial artworks that challenge notions of identity, religion and the status quo. Hailing from Britain, this will be the first solo exhibition of the artist in the United States. Much of Maple’s inspiration originates from being raised Muslim, with parents of mixed religious and cultural backgrounds. 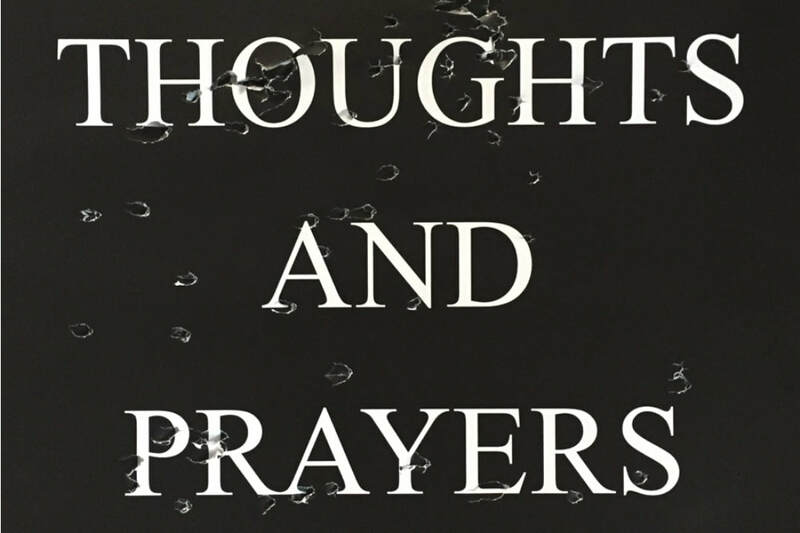 “Thoughts and Prayers” will feature many new works, as well as a selection of some of her most notable past works, exploring a wide variety of media including performance, painting, photography, sculpture, collage, installation, and video. Maple’s pro-feminist artwork provokes a dialogue with her sharp humor and satirical eye. She fearlessly addresses what it means to be a Muslim in the Western world. Her taboo-breaking artwork fights against censorship as she investigates themes of politics, violence, freedom, feminism, and the ironies of pop culture. guerrilla-style performance as a means to convey her message. I see many parallels between the UK and the US, especially with Brexit and the Trump election. The gun debate is something especially intriguing to the British. The threat of terror is continually focused on and yet nothing is done about gun laws. When officials offer up “Thoughts And Prayers,” it appears hollow and insincere. I am interested in how a lack of action directly and/or indirectly inflicts suffering and potential violence on its citizens. Also inspired by feminism and gender politics, my work aims to challenge deep-seated ideas about what it means to be a woman. I am interested in the role shame plays in women’s lives -how we take up space in the world, our physical appearance, bodily functions and “blame culture.” I explore the ways we can change the visual narrative for women as a form of empowerment. The medium I choose is determined by the strongest way to deliver my message; hence it is constantly evolving across a wide variety of media. The Untitled Space is an art gallery located in Tribeca, New York in a landmark building on Lispenard Street. Founded in 2014 by Indira Cesarine, the gallery features an ongoing curation of exhibits of emerging and established contemporary artists exploring conceptual framework and boundary-pushing ideology through mediums of painting, sculpture, printmaking, photography, video and performance art. The gallery is committing to exploring new ideas vis-à-vis traditional and new mediums and highlights a program of “Women in Art” as well as special events aligned with our creative vision.